NYC, 02/08/2019, 1:00PM. The Bookshop (2017): The Magic Of Books. 113 min. Director: Isabel Coixet. Starring Emily Mortimer, Bill Nighy, Hunter Tremayne. 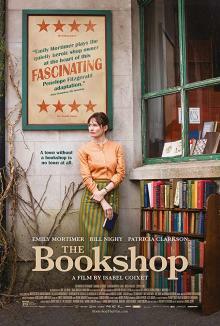 The Bookshop is based on the novel of the same name by Penelope Fitzgerald. It was shot in Portaferry and Strangford, County Down, Northern Ireland, and in Barcelona during August and September 2016.